We published a paper in this month’s Molecular Phylogenetics and Evolution on the relationships of some finch-billed tanagers in the genera Nesospiza and Rowettia. These four tanagers are unusual in that they are the only tanagers found outside of the Americas, occurring on Gough Island and the Tristan da Cunha archipelago in the South Atlantic. These are some of the most remote islands in the word and are about halfway between South America and Africa. 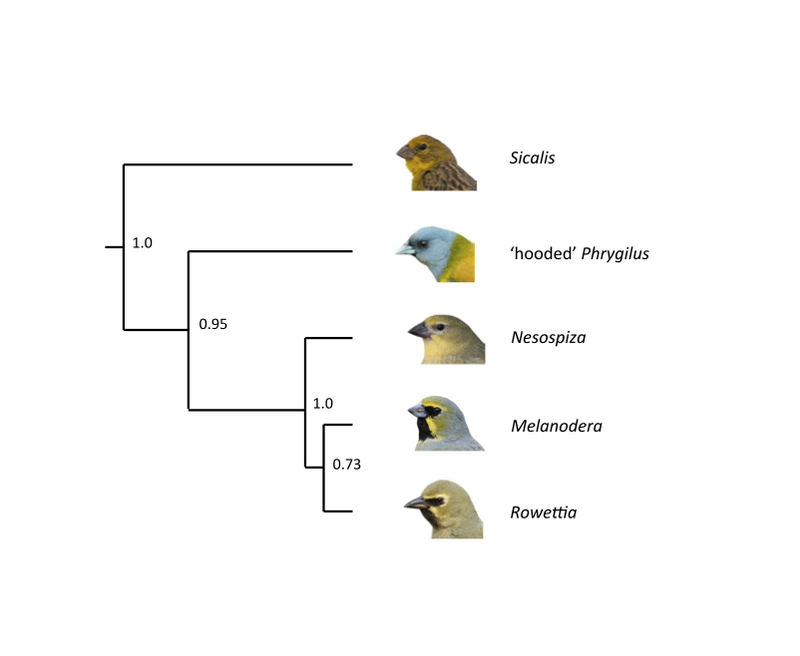 Remarkably, the topology of our trees indicates that there were two colonization events to these islands; the Gough Island Finch (the sole member of the genus Rowettia) is not the sister species to the Nesospiza finches. This project represents a collaboration with colleagues Peter Ryan and Keith Barker and was a side project of Burns lab MS student Luke Klicka. If you would like a pdf, you can go to journal’s web site or just send an e-mail to kburns@mail.sdsu.edu. Species tree generated in *BEAST showing relationships of Nesospiza and Rowettia to South American tanagers. Posterior probabilities are given at each node. The island species are not each other’s closest relatives.